Using a special ultrasound called "Doppler" this procedure evaluates blood flow. Doppler ultrasound is a standard part of the vascular ultrasound that Dr. Maddahi prescribes at his Los Angeles cardiology practice to find any blockage or abnormalities. We will use this to look for blood clots, check for enlarged arteries or to locate the source for varicose veins. The vascular ultrasound is also used to determine if you would benefit from a cardiac procedure such as angioplasty, or to check on how well your previous surgeries are working. 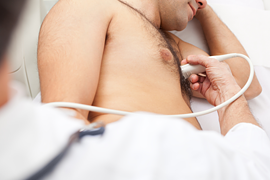 Contact our office for instructions to prepare for your vascular ultrasound. We will prepare instructions that are tailored just for you. We ask that you tell our office about any medications (prescription or over the counter) you are taking. We will also need to be advised of any medical devices, or implants you may be using. Dr. Maddahi will provide advice on continuing medications, special precautions for devices and if fasting is recommended. This test is non-invasive and involves your laying still on an examination table. We may dim the lights so that we can see the monitor screen easily. We will use a wand called a Transducer to see your heart. To perform the test, a small amount of gel is placed on your chest. This gel is so that contact is kept between your chest and the transducer. We will pass this wand over your chest several times to take pictures or video of your heart. It is just that easy and painless. Dr. Maddahi prides himself in the success of his patients. Once he has taken you on as a patient, it becomes his mission to restore you to good health. Your vascular ultrasound test is just a beginning step on a proven path to heart fitness. As one of the best cardiologists in Los Angeles, Dr. Jamshid Maddahi offers the excellence in care you deserve.